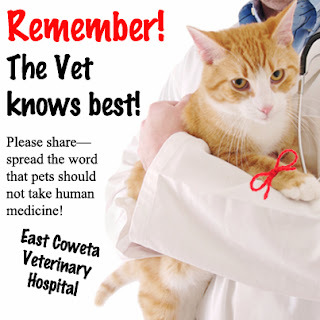 Did you know that your cat should be in to see us at East Coweta Veterinary Hospital once a year all their life, and sometimes twice a year when they’re over seven years of age? Today is National “Take Your Cat to the Vet” Day—if your cat is due for a visit, call and schedule one today. Regular visits can help your cat live longer, because we can identify and treat problems sooner. 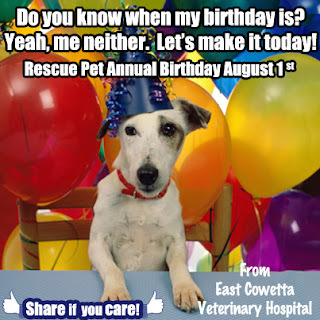 August 26th is National Dog Day, celebrating shelter dogs that have been rescued and given a brand new life. Is your dog a rescue? Share his or her story with us on this special day! Are you taking your dog with you on a family camping trip this summer? Don’t forget to be prepared for pet care! It’s important that your pet is up-to-date on parasite prevention and has plenty of food and fresh, filtered or sanitized water to drink at the campground. Also, be prepared for safety by ensuring that your campground of choice allows dogs to visit, and that your dog has a place to sleep, preferably inside the tent where they won’t be bitten by insects or pestered by wild animals! Be safe, and the trip will be that much more fun! It’s important to keep your medicines out of your pet’s reach at all times, because human medication can be toxic to your pets! When your pet feels sick or is acting under the weather, never give them a human medicine, but bring them in for veterinary care instead. Even if you mean well, a dose of human medicine could be fatal to your pet.